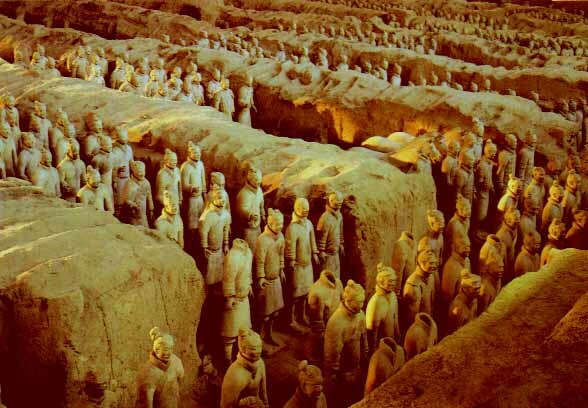 The Terra Cotta Warriors and Horses in China were buried 2,200 years ago in underground vaults which are 1.5 km East of the Mausoleum of the first Chinese Emperor, Qin Shihuangdi. There are three vaults, the first vault were accidentally discovered by local peasants while digging a well during a drought in 1974. Vault I contains 1,000 soldiers, 8 war chariots and 32 horses. Vault II contains 1,300 warriors and horses and 89 war chariots. Vault III contains 68 terra cotta figurines, 4 chariot horses and 1 wooden chariot .